This month’s cook the cover is the November issue of Eating Well magazine. I was convinced I would be making a healthy version of Thanksgiving dinner, or at least something to do with turkey. But no, Eating Well put chopped root vegetables on their cover. Raw vegetables, and I couldn’t even tell what some of them were (what is the red and white striped one anyways?). While I was secretly happy that I wouldn’t be making a turkey, I wasn’t quite sure what to do. 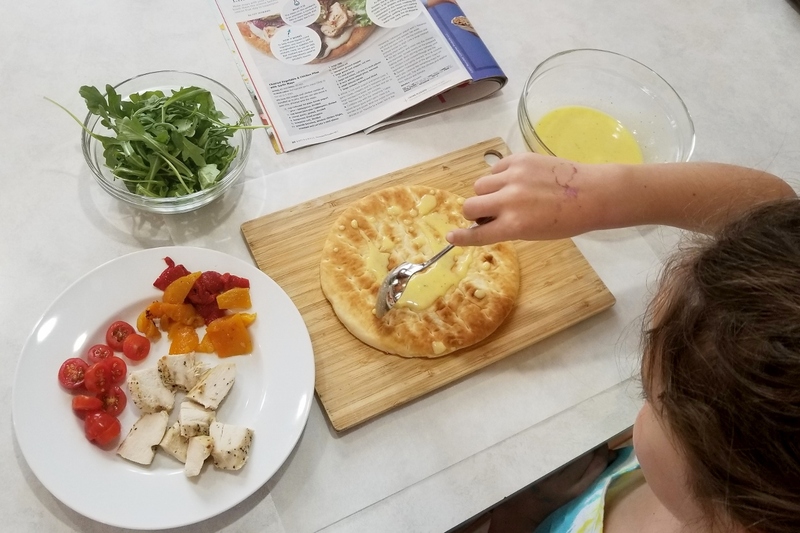 I flipped through the magazine and noticed a “cooking with kids” article. 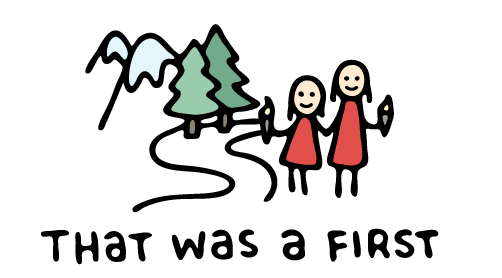 Now we have something! The kids are going to cook the “cover” this month and learn some new skills. I recruited my eight year old for the job, and she happily got to work. 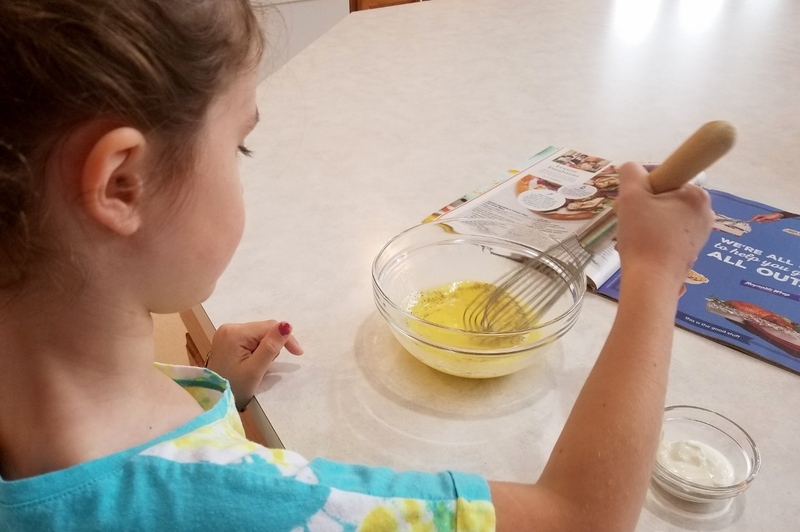 Seriously, how many eight year olds do you know who cook what’s featured in a magazine? Maybe someday soon, you’ll know of a few! 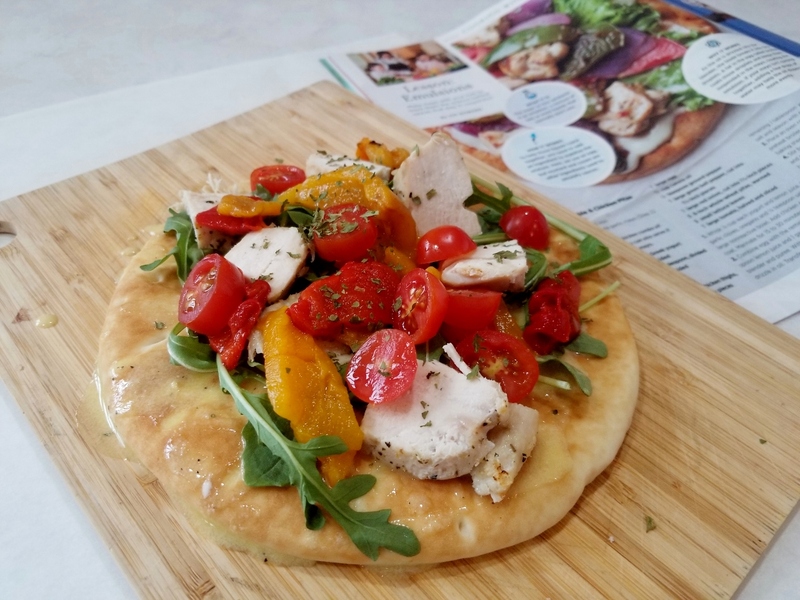 The recipe for the month is Charred Vegetables and Chicken Pitas with Garlic Mayo, and the lesson to go along with it is emulsions and how to make mayonnaise. Making homemade mayonnaise was going to be a first for both of us! Do you think this mayo is going to taste better than what comes out of the jar? 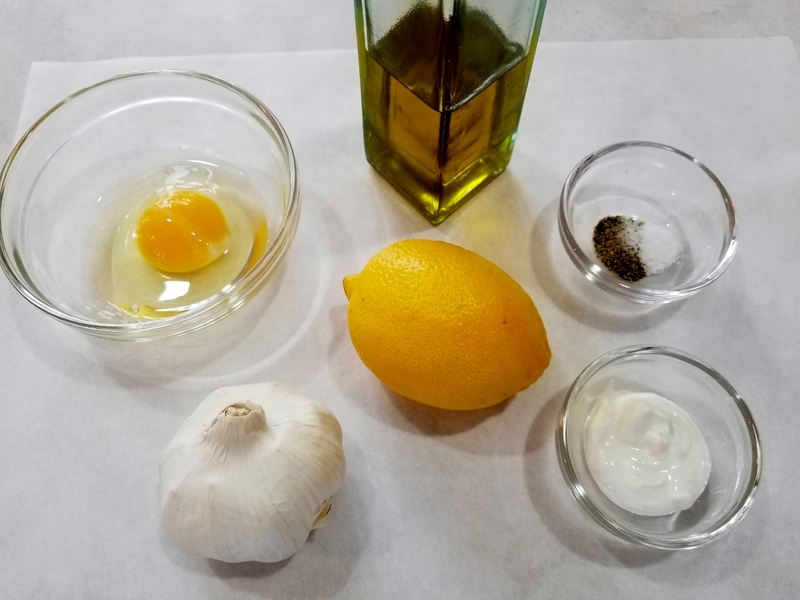 The egg, 1 T of lemon juice, and one clove of garlic were pureed in a blender. Then the oil was drizzled in. Next the mixture was put into a bowl and the yogurt, salt, and pepper were mixed in. Once the mayo was made, it was time to make the pitas. 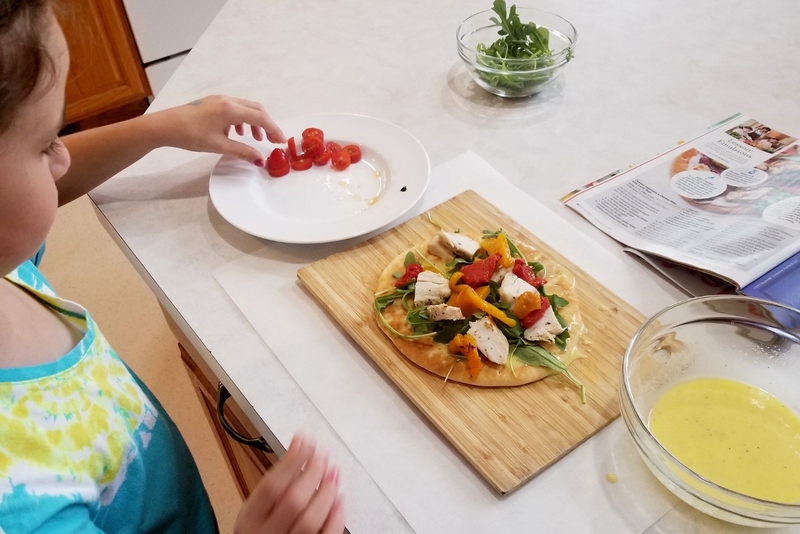 The pitas were topped with roasted peppers, roasted chicken breast, tomatoes and lettuce. First the mayo is spread on the pita, and then the toppings go on. The mayo goes down first. So easy an eight year old can do it! The toppings could also be served over rice or pasta, if you didn’t want to use a pita. There are also endless meat and veggie combinations that you could use as well. And there you have a colorful, healthy, and delicious charred vegetable and chicken pita with garlic mayo! The charred vegetables tasted so good with the garlic mayo, and the chicken was extra juicy! I think we’ll be making this recipe again and again. This monthly cook the cover challenge is fun in so many ways. First there is the element of surprise, because you don’t know what you are going to be making. Then, you have to read the recipe and take on the challenge of a possible new cooking technique, or maybe you get to try a new ingredient or two. Finally, you get the satisfaction of the final meal and knowing that yes, you are a pretty darn good cook! We are feeling a little festive with the Christmas season approaching, so for next month, I’m going to cook whatever is on the cover of the December issue of Bon Appetit. I’m guessing the dish will have something to do with the holidays, and hopefully won’t be to difficult to make! I challenge your family to pick up the December issue of Bon Appetit and join us in cooking the cover!